No matter how much fun you are having at the parks, you eventually need to slow down and grab a bite. Some of Disney's most beloved dining locations host Christmas dinner, featuring special seasonal menus. While not every theme park dining location offers a special Christmas menu, all Disney World Restaurants will be open Christmas Day. Disney features different restaurants hosting holiday meals each year. 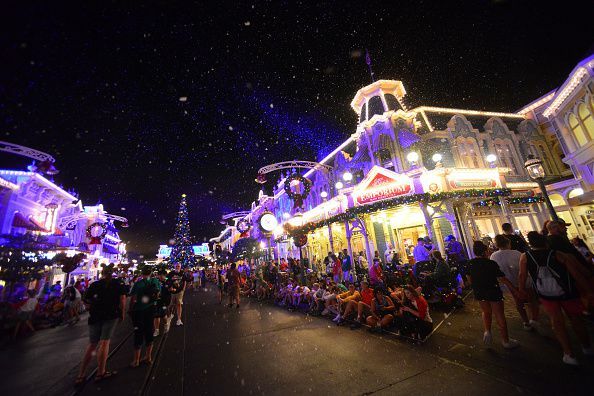 Walt Disney World can get crowded over the December school holidays. If you want to dine at a table service location for your Christmas meal, a reservation (sometimes available 180 days in advance) is a must. In fact, this is true every day in December at Disney World. Make sure you arrive early by giving yourself a little extra driving time or take advantage of the Disney Transportation system. Plan ahead and enjoy a special Christmas meal this year at the Magic Kingdom, Epcot, or the Animal Kingdom. Saana, an African-inspired restaurant in Disney's Animal Kingdom Villas at Kidani Village, will be serving Christmas Day lunch and dinner. Saana is a place to experience African and Indian flavors, as exotic animals roam the Sunset Savanna within sight of your table. At the Biergarten in the Germany Pavilion of Epcot Center, celebrate the Christmas season with a hearty brew and enjoy the Christmas menu at lunch or dinner in Germany. You will be transported to a traditional Bavarian village as you feast on German-style fare at communal Biergarten tables while listening to the oompah beat of a lively band. Guests can enjoy a great selection of​ German beers and wines. The Ale and Compass Restaurant in the Magic Kingdom near the Disney Yacht Club Resort is known for New England comfort food and classic seafood dishes in a pub-inspired restaurant, reminiscent of a lighthouse. For Christmas, they will be serving a special brunch and dinner. The Rose & Crown Dining Room in Epcot's Great Britain Pavillion will be serving Christmas day lunch and dinner. The Rose and Crown is a family-friendly British pub featuring traditional pub favorites by the waterfront. Dine inside or outside on the patio overlooking the World Showcase Lagoon. The Whispering Canyon Cafe will be serving Christmas lunch and dinner. Located in the Magic Kingdom Resort Area at Disney's Wilderness Lodge, Whispering Canyon Cafe has a retro-western theme. Enjoy the log-cabin style lodge with rough-hewn charm. There's sure to be some chuckwagon type favorites on the menu too. During the holiday season consider purchasing a special Candlelight Dining package that comes with guaranteed seating for Epcot's popular holiday Candlelight Processional celebration. The popular Candlelight Processional features a celebrity narrator, 50-piece orchestra, and a huge choir. Choose breakfast, lunch, or dinner at several dining venue choices; reservations are highly recommended.